Arcane Roots are one of the most exciting rock bands on the British circuit at the moment. Their fearless approach to intricate and heavy riffs combined with massive pop hooks has allowed their music to cross-over and appeal to fans of a number of different rock sub-genres. The band has released a number of EPs and 2 full-length albums that have both been hailed by critics and fans alike. Blood & Chemistry was praised for its stadium-sized riffs and off-kilter beats and rhythms and this was followed up by the electronica-fused Melancholia Hymns. This trio have gained a reputation for the sheer ‘size’ of their live shows and much of this is thanks to Andrew Groves massive guitar riffs and guitar sound – not to mention his incredible voice and the stunning wall of sound produced by the rest of the band. The Arcane Roots guitar sound is all Fender. Early on in his career, Groves used a Mexican Tele to get gnarly, fat, biting sounds that cut through the gain he used on his amp. The single coil pickups also add a touch more clarity when using octave and fuzz pedals which is how he cuts through the mix so well, even though he has all of those additional low frequencies. Recently, he moved over to using a Fender Custom Shop Strat with Texas Special-style pickups and it made choosing a guitar to get that sound really easy. Rabea and Matt chose the Squier Classic Vibe 60s guitar to give them the Rosewood board with the slightly hotter single coil pickups. 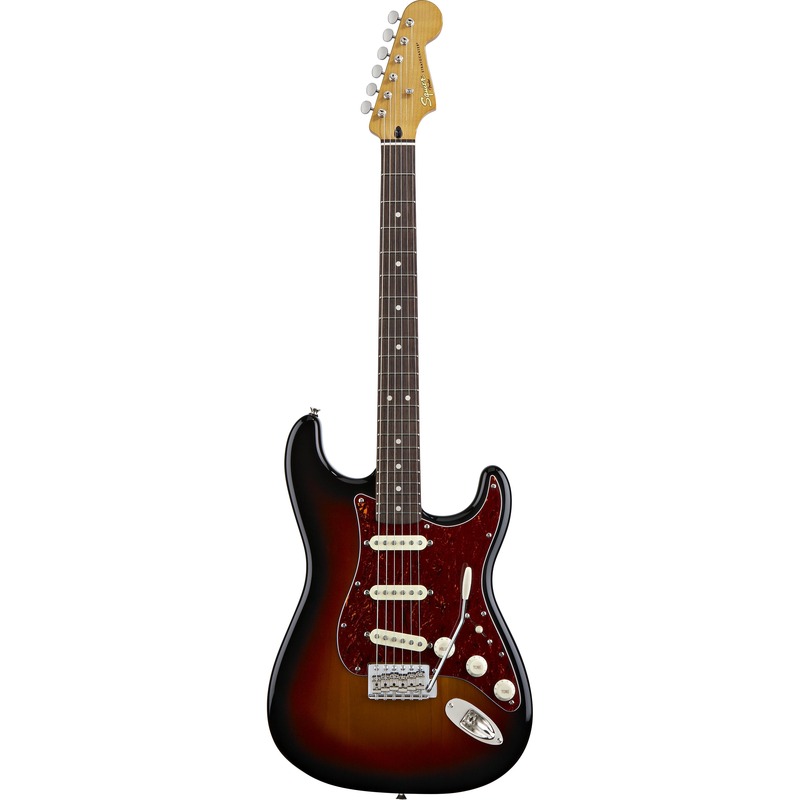 Another good choice would be the Simon Neil Signature Squier Strat. Your best bet is to go for a Strat with spanky Strat pickups to help you nail that twang factor whilst retaining a fat, bold low-end. Andrew Groves is now on the Victory Amplification artist roster and his live setup consists of the British-sounding Sheriff 22 and the distinctly American-sounding Kraken! Having these 2 amps working in tandem allows him to cover a large frequency bandwidth as the Sheriff 22 is heavily mid-focused while the Kraken has a powerful low-end and clear top-end. This is how he gets one guitar to sound like 2 guitarists playing at once – it’s just a massive wall of sound. 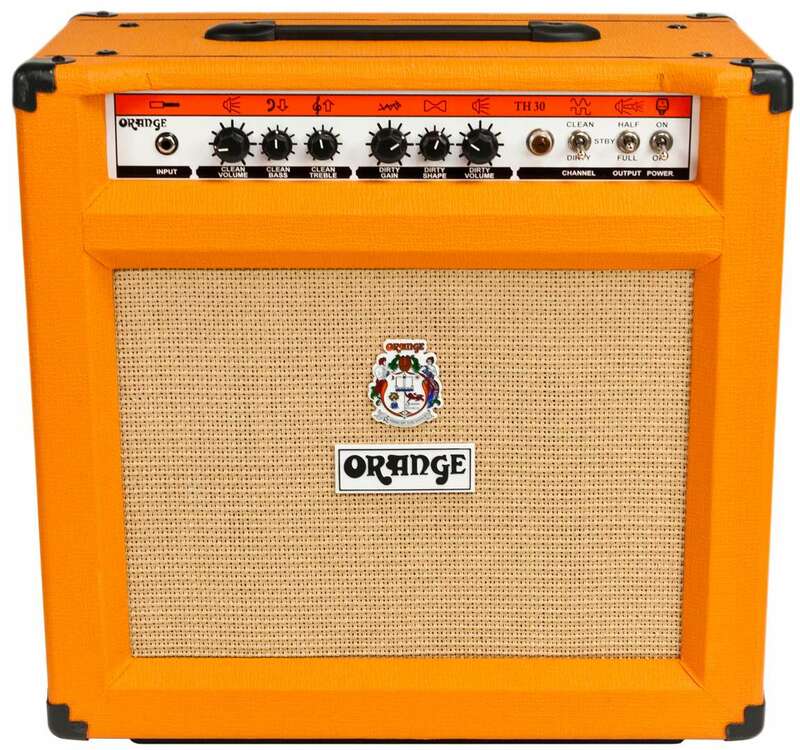 The best way to get the Arcane Roots sound is to go for something like an Orange TH30 which is affordable but has a massive sonic footprint and because this is the exact amp he used on early Arcane Roots records. Orange tube amps have a fat and bold low-end and take pedals really well. They also sound massive when used with octave pedals thanks to their ability to handle low-end and push out those tones with immense clarity. To summarise an Arcane Roots pedal setup in one go you’d be looking at a Fuzz for massive gain sounds > An Octave pedal to give the additional low-end and fatten up the sound > An EQ pedal to tighten up the extra gain and extra low-end > A touch of ambient reverb to increase the overall size of the guitar sound. You’ll probably notice that all of Groves pedal choices are to make his guitar bigger than it would be on its own and this is paramount to getting a big sound in a three-piece band where there’s only one guitar player. The key choices that Rabea & Matt made included the Boss OC-3 which is a fantastic Octave pedal that tracks really well, especially with single-note riffs. The EarthQuaker Dispatch Master is the perfect choice for Reverb & Delay in one pedal and can be set to be ‘always on’ to ghost your notes and thicken everything up. Any Fuzz pedal will do the trick but you’ll probably want a Big Muff-style pedal as these have got more woofy lows and will sound better with your single coil pickups than a mid-range focused fuzz pedal. As far as EQ goes, you’ll be able to get away with getting a simple Hotone EQ or something similarly affordable as you just want to use it to rein in those wild frequencies that you’ll be creating with all of the gain and octave fuzz that you’ll be using. Do you think Rabea & Matt got close to the Arcane Roots sound? Leave a comment below and share your thoughts! If you’re interested in finding out how to achieve the tones of your favourite artists, check out more of our Sound Like articles by clicking here. Matt Hornby: Hi guys, I'm Matt. Matt: This is Sounds like on Andertons TV. Matt: Today, we have the absolute pleasure of trying to sound like a really good band that we really like. Rabea: Yes, we do, and that band is Arcane Roots. Matt: Arcane Roots. For those who might not know Arcane Roots, they're a British band of the alternative rock genre from the London area. Rabea: High energy, anthemic and it's wicked. Rabea: It's going to be good. I would say that the sort of tones you'd expect to like Fender Strat kind of tones, but thick with octaves and fuzzy and just really balls out. They're a three-piece. Matt: They sound huge for a three-piece and it’s one of those bands that I noticed a nice take on a Strat and really modern sound. It's almost, I guess in the ballpark of a guitar equivalent of the Royal Blood one did. Rabea: Yes, in a way. Rabea: If you've never heard of Arcane Roots go and check them out, but we're going to go and just try to get some gear to sound like Arcane Roots, I guess. Guitars, guitars, guitars, guitars, guitars. Matt: Yes, indeed. Their guitarist whose name is Andrew Groves. He plays a custom shop Fender Strat. Rabea: He used to use Teles and Strats of all variety from back in the day. Matt: The main message is Teles- I'm sorry, not. Rabea: Pickups wise is the Texas special style voiced pickups. Rabea: Yes. Let's go check out some Fender. Matt: Let's have a look. The general idea I think is something Sunburst with '50s pickups with a Rosewood board. Matt: That would have been a good one. Rabea: --that would have been a very good choice, but we can't use anyone else's sig for someone else's rig. Rabea: Here's where you go Mexican Strat or classic vibe. Matt: To be honest on this one, I think because we need pedals and the amp's going to be pretty expensive. Matt: I think we get the guitars as cheap as we can. Rabea: Okay. This is the '60s classic vibe. It's got the '60s voice pickups, Rosewood fretboard and they play really well. To be honest, we're probably going to get somewhere close with this bad boy. Nice. Matthew, amplification. Matt: We're told that Andrew of Arcane Roots uses a combination of Fenders and Oranges in his live arsenal. Rabea: Though Orange was the long stay. Matt: I think the one he tried using from the very beginning so we're thinking Orange. As I said before, we really want Valve and a good amount of wattage so we can jam over our fictional drummer. Rabea: In fairness, we've never really used Orange in Sounds Like before. It would be really nice to actually give it a go and see how close we get. Just spotted a TH-30 combo just there which is a 30-watt all valve combo. Matt: These, if my memory serves me greatly, are about 750 quid. Rabea: Okay, which is not bad considering the guitar's 400. Matt: The product is exactly half of our budget. Rabea: Tiny Terror version of a clean channel and a Tiny Terror version of a dirty channel because what you've got is the control layout is exactly the same as Tiny Terror. Only half of full power so you can go down to 15 watts if you want. It's basically two Tiny Terrors in one, but one's clean and one's dirty. We're going to be looking at pedals now for the Arcane Roots rig. Matt: Yes, we need a few. So far we have the 750 pounds Orange combo as well as our 400 pounds Squier Classic Vibe. Rabea: Yes. We need to get a delay and a reverb and an octave pedal. Sorry dude, can you just keep that? Matt: It's summer, it gets really really busy. Rabea: Anyway, pedals. It seems like a lot of the alternative rock bands do actually have a lot of pedals and pedals, as we all know, if you build up your pedal board over time, but if you're buying your rig at one go having to get all the pedals you're racking up hundreds of pounds. Matt: Even when you get, "Oh, it's only 80 quid. That's only a hundred quid." by the time you know you've spent 500. Rabea: Yes. We've come up with a couple of good ones, haven't we? Matt: --and an EQ to get a slight mid-boosting sound. Rabea: To start with we're going to use the Hotone EQ which is over here. Rabea: Just over here and in that little cabinet there and then on top of that we want to be using the OC-3 by Boss. Rabea: Which is over there at the side which we're not going to walk to. Rabea: We do have a big muff. Matt: --for a bit gainey sound. Rabea: Which is over here. The other thing that I just wanted to mention is sometimes when you have to have a pedal or two pedals to do specific jobs like delay and reverb. Sometimes it's better to find a pedal that does both in one go. Matt: We have found one this time and it's close same as about 20 quid, but we thought it's definitely worth it to try and stick to the budget. Rabea: That is the Earthquake Devices Dispatch master that does both reverb and delay in one go. Matt: For only about 150 pounds. We'll total it all up and get it all back to the room and see how we do, I think. Rabea: Let's give it a go. Rabea: We're back in the video room. Matt: We are indeed back in the video room. Rabea: We were interrupted by this gentleman over here. Mr. Andrew Groves of Arcane Roots. Rabea: It's an absolute pleasure to have you on Sounds like. Matt: It's very very cool. Rabea: Obviously, this wasn't actually planned. Originally, we did intend to do a Sounds like Arcane Roots because we're big fans of the band, but then it obviously turned into a bit of a, "Hey, wouldn't this be cool if this happened" kind of vibe. Matt: It's a new idea because we've been tired of sitting here, both of us, racking out loads of artists songs, but it's a nice- I don't know. I think it's nice to introduce you guys to some bands you may or may not have heard of. Rabea: There you go. The first question I have to ask is did we sound like you? Andrew: Yes, I think with everything I have always felt very under qualified. When you're starting out building your tones and the things you like, obviously, you take things from other people. I always found I would take something hoping to sound like someone, but end up using it wrong then unwittingly you come up with a sound. I think it sounded pretty close. Rabea: Good, I'm glad. Basically, we had a couple of questions that we had lined up for you and I'm sure people out there in Youtube want to know as well. I suppose my first question is, how similar is it to when you first started out? Obviously, I know you can build it with amps and new pedals come out and stuff. Is there anything that's just been a mainstay from day one? Andrew: It evolved with my music taste and the music I was listening to. I think I did well by buying- I wanted to sound like John Frusciante. He was my big idol. I did well by investing in a Vox. Is it the V 8476389? A tube screamer which stayed into its last legs and a big muff. I had those three on there for the longest time, but again, I think I forever felt underqualified or wishing for someone to come along and they're like, "No, no this is what you should do". Ironically, I've moved towards other things and then actually come back round again. I started off on an SG and a Vox AC-30 and then have done this big full circle went back to playing Fenders and bringing back a muff into that. Matt: I was going to ask about playing style influences and all of those things. Who were your biggest guitar heroes even in terms of gear style, writing all that stuff? Andrew: I got into heavier music really late. I was against any kind of metal screaming, anything from the '80s. Andrew: I wanted to play at the time I was 14 or whatever. I just want to listen to and play Limp Bizkit and Korn and Papa Roach and Linkin Park. Andrew: Exactly. Then you'd go on guessthetab.com or whatever and then they would be someone's first attempt, but always in some ridiculous tuning with more strings than I had, my little Peavey Raptor, I think I had. I can never happen to- at that age, it just was so much effort and just so annoying. I could never get the sound I wanted and nobody knows the second chord of Blind. No one knows that chord. You're not allowed to know that chord. I actually fell out of love for the music almost purely because I can't really access this and so I searched for bands that, that was the next challenge. Friends of mine recommended the Red Hot Chili Peppers and then John Frusciante came into my life and that was the next evolution. People like Mike Einziger from Incubus and his chords, I was excited to get really into, but at the same time my guitar teacher was a Jazz Fusion player and he was drilling Allan Holdsworth and Pat Metheny into me, and I wanted to be able to make a song that sounds like the blues song, I wanted to make a song that sounds like this so I went to him to be like, "Teach me about chords and theory and what I should do with that". I have this weird duality going on where I was listening to a lot- The Chilis slip into some of it, but this funk jazz thing and then trying to find bands to listen to and it wasn't until I was much older that I heard Jaggy Snake at college and I thought the chords were really nice, but I hated the screaming and so I learned the chords thinking that was really interesting. Inevitably, I think I downloaded it from LimeWire- sorry Biffy as you did and it just went on from there. Ever since I like King Crimson and these old bands. Old bands, Pink Floyd, Dave Gilmour was a massive influence for me. I remember just looking at his guitar and being like, "It's not as neat and tidy as my guitar." How do I get that sound and have that woody tone he had? I've had this weird thing where I slowly got into some metal through the back door. Bands like Reuben and then like Mars Volta. Thomas Erak, that really helped me get into Arcane Roots as far as needing to sing and I needed some idols to look up to be able to, "I can sing and play.". I had to really invent a way to play the guitar lines I wanted to play and it not-- You're playing in a three-piece, as soon as I stopped playing the chords and have even solos or want to play something fiddly, it just went down and there's no crescendo. It should be build-up, solo and it isn't. It was a case of learning how to get around that and, final thing, my jazz influences helped with that because that follows that kind of thing. Rabea Massaad: I reckon the next best thing to do is to look at our rig and at the end of the day we're trying to sound like you, and so I reckon it's important that we go through each one. Come on, man, it's great tunes, great riffs, and great tones. We'll start with the guitar and this was quite a difficult one because- we've chosen the '60s classic vibe Squier Strat and this is not an uncommon guitar for us to pick when we try to sound like certain people, but you actually had your own custom shop model made for you didn't you? Rabea Massaad: What pickups did you put in that? Rabea Massaad: We did right getting a '60s classic vibe. We're also aware that you use both Fender amps and Orange amps, and to be fair this was the difficult thing, it was tricky. Andrew Groves: I didn't think it would be that difficult. I thought the pedals would be the hard thing. Matt Hornby: Yes, because you use a Fender for your overdrive tones. Oh no, you use both for both. Andrew Groves: I use both for- In my mind, I just feel so under-qualified and primitive in my knowledge, but for example, in mind the Fender is clean. It just sounds fantastic, but then there just seems to be no other amp that does the distortion that I need to be able to play rhythm and lead lines with clarity and again, I took a lead from people like Thomas Erak and the Omar Rodriguez who used the amp in this way and so I fell into that way. The Orange is the body if it makes sense and the same thing for the clean. I make it, essentially, a bluesy dirty clean on the orange and then just gained dimed - for my distortion channel, but then I set the Fender on top of that and that gives more clarity. In my mind that makes sense. Rabea Massaad: Obviously, we've got a £1500 budget so getting a Fender amp and an orange amp would be impossible. Rabea Massaad: We move onto pedals next- Obviously, we've already discussed the fact that there's a lot of octave going on and fuzzy overloaded tones going on and so we knew we wanted to get that. We knew we wanted the octave and some fuzz. Do you use the OC3? What's your pedal board looking like? Andrew Groves: I've kind of just fallen into things. When we first recorded Sacred Shapes I was using- I think it was actually the first time we used an octave pedal. I had an OC2. Our producer, Chris Coulter, had and I started using that once the band got going. I was like, " I need to get that stuff" and that happened to be the only one that existed so I used the poly mode on this. A big problem with the octave side of things is tracking and there's nothing worse because when an octave pedal doesn't track - Especially on the E string so literally on the poly mode I then blend the two signals pretty much 100% and the cool thing about it is you've got this mix-mode so you can control for example, where in the spectrum the octave is coming in so you could have it where the octave only comes in on the E and the A string and then when you use any other strings you could do that. I use this mainly for medium riffs and I have to shout out the Gigrig guys, they make my- I've had a very noisy rig and my general stupidity, something must have happened, but there's something to be said about using good cables and good power and that is now a problem in the past. I usually have a boss GP-10 which has a similar octave sound to this. The cool thing is you can control in which order the effects have run, and you can also assign anything to any part of the pedal and also have it, you press one button and it does five different things for you at once. I essentially have this in a pedal if that makes sense whereas- I basically had a fling with Meshuggah, Periphery and I felt like some of their tones were almost- that makes sense, that very woody percussive tone and Tesseract and stuff. Essentially, what this does is it essentially tames this octave. I take out a little bit of low-end and a bit of mud that you get with a lot of octave pedals. Then, basically, try and find essentially find my single coil through the mixes with the EQ and boost. I think we're boosting here some 1.6K, but then essentially just that little bit of presence peak because usually with the octave if you just get a low end I try and get a nice blend of the two and end up with a pretty nice, very djenty sound thing. Matt: Okay. 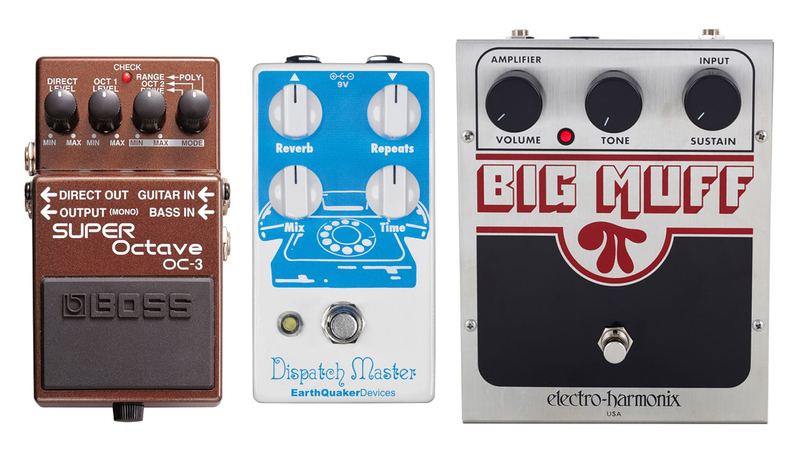 The next pedal in the chain is the deluxe big muff. Now, we got that for a like some fuzz tones. We realized we got it- to be honest, feel the deluxe version just to give us a few more tone-sculpting options. In that process, we realized we had a nice mid boost- and a Gate. Rabea: You use the green carrot pedals pumpkin pi don't you? Because I just got one of those because you got one. Rabea: That was really nice. Andrew: Fantastic. I have to give a massive shout out to Andy. Then he- I think I just did a tweet being like I just wanted- I've had fuzz pedals before. They were sound great in the studio but to get them sound good in live is super hard I think. You get to again what we're saying with all solo thing you get to it in - it's just all rumble, all low end. He sent me one to try out and that on the cornstar. I'm actually using the cornstar before the pumpkin pi which is like a TS9 plexi type of vibe. Andrew: Yes, together because it's a not in a similar way to this pursuit meant so much. It's essentially two big muffs put together that's the pumpkin pi. Rabea: I mean it sounded like it to me. It sounds like it to me. It sounds like sort of similar fuzz tones to the ones you get. Matt: Ended up doing pretty much what this is. Matt: It's interesting to me the mid boost and then fuzz on top of the amp drive. Rabea: It's actually really affordable as well so 80? Rabea: We got the old Dispatch Master. Matt: We have. This was chosen based on budget alone. We worked out that this was cheaper than buying, delay and reverb even the cheapest you could find together. This essentially does both reverb and delay. Rabea: I think because a lot of your songs have ambient sections and clean tapped guitar lines just really euphoric moments. It's really important that we got that right. What are you using then for your ambient sounds? Then what do you go for? Andrew: We're using a Strymon Timeline. Matt: Actually, from inspired by Rabea, that's the reason I went down that route see I'm saving up for a Big Sky to have that going along as well. They're just- but again, the same thing that's just very musical. The great thing as well as like I say our live show is getting more and more complicated by the day. It's just nice to have - I can MIDI control everything. Have all those delays and about that any tapping or any other thinking. Rabea: I think it's fair to say that if you found a really nice patch on the Timeline and one on the Big Sky that's essentially what this is because the quality is there. Rabea: Like the favourite setting. Matt: -It's a small to take on a plane isn't making but if you can't afford a Strymon this is great. Rabea: Very very really good. Rabea: I have one more question before we wrap things up and that is just what's the plan? What's the future of Arcane Roots? What's going on? What's happening? What's the future? Andrew: Right. We're currently finishing our new album that was the reason for me to shuffle all my pedals around and have something to be able to write with more instantly than have it all tucked away in whatever. We're kind of deep in writing mode and finishing off. We just did Reading & Leeds which was amazing. Andrew: Then hopefully a new album in the new year so we’ve written an album we can't yet play. We’re having to work everything in pianos and samplers in alongside everything. It's going to be a bit of a juggler, but it should be interesting I have to build a whole new live rig now and throw everything else out the window. It's nice to be in that position. Andrew: I actually don't. I was trying to look for one. Andrew: Because I actually don't own over and over. Matt: Your songs on Spotify. Rabea: You can find it online. Andrew: We're going to be on Spotify. Rabea: Well, look man, absolutely thank you so much for coming in- for doing this because we're huge fans. Andrew: --in person and he's informed some of my choices. Thank you. Rabea: It's awesome. Hopefully, we'll get to do more this kind of thing in the future, but really, appreciate it, man. Andrew: Thank you so much. Thank you, both. Thank you. Matt: That’s that as usual, you can find all those gear in the description from the box below. Leave us your comments. Let you know, let us know how you think on our new format might have gone and what else you'd like to see. Matt and Rabea: This has been Sounds like on Andertons TV.